The decision to marry is the most important decision most people make in their lifetimes. Of course you want your service to be something you and your families will always remember fondly. Since the wedding ceremony is the start of the wedding celebration, Bill's feeling is it should be up-beat and positive. This is done by meeting with the couple in person or by telephone or via email and determining what their wishes and needs are. Some couples want a religious service, others prefer a more secular type service or a combination of both. The decision is theirs. Once this is decided Bill goes to work on it and the result is a very nice wedding service. You want your guests to go on to the reception with a good feeling and a smile on their face. 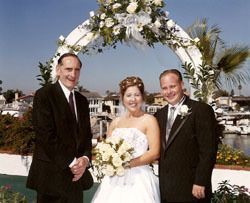 Bill's goal is to start the celebration off happily and create a truly memorable experience.